Most dogs love riding in cars to see all those interesting sights out of the window and to spend time with their favourite humans, which is why you should make your car dog-friendly. While many new vehicles come with all kinds of dog-friendly features, you can make a few adjustments to your existing one to make your car dog-friendly too. Simple safety tips like preventing your pooch from running wild while you drive are easy to implement, not to mention that many provinces now have laws that require dogs to be buckled-in or otherwise restrained, just like their humans. To keep your four-legged friend safe and comfortable on your road trips, read on to discover how to make your car dog-friendly. While you probably love driving with your furry buddy next to you, the safest place for her is in the back seat. Just like young children, dogs can easily become injured by front airbags after an accident. Plus, dogs can become a dangerous distraction to drivers in the front. Prevent your pooch from getting up front by purchasing special ventilated barriers that you can put in place to separate the front and back seats. They keep your dog from jumping into the front of the car and causing accident-inducing mayhem. These barriers also prevent her from being projected over the front seats in the case of an accident. Cover back seats with waterproof pet seat covers to prevent potty accidents and fur shedding. This way, you can toss these in the wash after your car trips for quick-and-easy cleanup. The safest space for your dog in the car is in a carrier or crate, especially for longer trips. Set one up in the back seat and put a cozy blanket inside to keep Lassie comfy. Look for strong crash-tested crates that can withstand the force of an airbag in case of an accident. Even in the back seat, some newer cars feature side air bags that could affect your pup. Ensure that the crate or carrier is well-ventilated, so your dog can breathe and stays cool. Choose a crate that your dog can comfortably sit, stand and lay down in. If your furry buddy tends to get car-sick, block her view of the side windows with a lightweight blanket to help prevent motion sickness. Whether she’s in a crate or not, always buckle your dog in to keep your pooch secure. Secure crates in place with seat belts or fasteners, much as you would a child’s car seat. Don’t want to crate your pup? Get her a special car harness that you can use to keep her secured to the seat belt. These harnesses are especially handy for large dogs. For smaller pups, you can purchase bed-like booster seats that keep dogs elevated and buckled in for their safety. Some pet booster seats are even heated to keep your pup cozy in cooler temperatures. If you’re planning on a longer drive, don’t forget to bring along some supplies. Bring bottled water and a spill-proof doggie bowl for your canine companion. A few dog-specific snacks are a great way to reward your pooch for good behaviour within the vehicle. Plus, they keep her satisfied until you reach your destination. Occupy Lassie with a favourite toy from home. Use a dog-appeasing pheromone spray around the vehicle to calm your pooch. 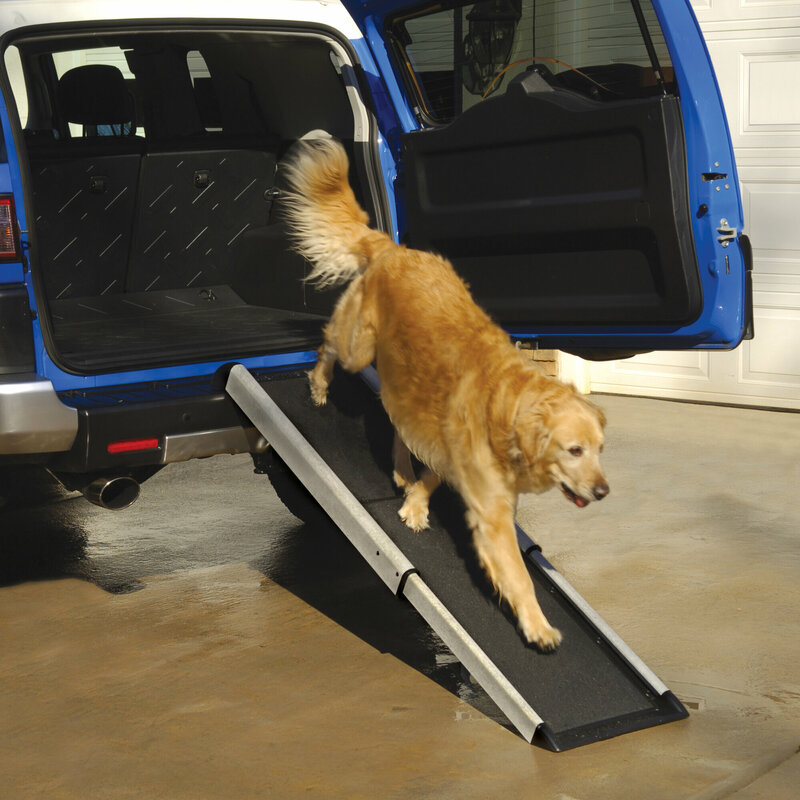 Make getting into the car a breeze with a portable dog ramp. Remember, ensuring your vehicle is comfy and safe for your pooch is the best way to make your car dog-friendly. Additional Safety Tips to Make Your Car Dog-Friendly. After acclimating your pooch to your car, she should be ready for lots of road trips. However, there are a few additional safety tips to keep in mind. Temperatures can rise quickly inside a car, even with the windows cracked open, so never leave your pooch alone in a car unattended, even for a few minutes. Don’t let Lassie hang her head out of the window; she could easily become injured by other cars and debris. Keep windows shut while driving or crack them open an inch or two for ventilation. Engage the power window lock switch to prevent little paws from accidentally opening or closing car windows. Keep your pooch within your vehicle while you’re driving and out of truck beds or other spots outside of a moving vehicle. Taking these steps to make your car dog-friendly ensures that your pup will enjoy your rides together. Shower her with love outside of the car too with these pampering tips. Why Does My Dog Lick My Feet?